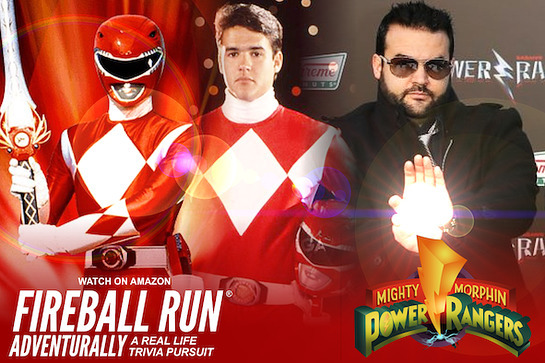 Actor and original Red Power Ranger, Austin St. John, is to be featured and compete in season 11, Fireball Run: Big Country – and will at the same time join the search for a missing child. Synopsis: Fireball Run is the real story of road warriors in a legendary competition across America in search of obscure historic artifacts, under-discovered places, and extraordinary experiences. And it’s all for bragging rights, a greater cause, and a plastic road sign. Available on Amazon, Fireball Run is a 26-episode adventure series which inspires viewers to explore the United States. Unlike Reality TV, Fireball Run, a Factual series, chronicles authentic experiences and notable places. To win the life-sized trivia game, teams take the road less traveled in an epic quest to re-discover America while also aiding in a massive effort to recover missing children. Paramedic, actor, author, martial artist, and original Red Power Ranger, Austin St. John was the first red suit in Saban Entertainment’s Mighty Morphin Power Rangers television series and has since appeared in several Ranger revival shows. Austin recently starred alongside John Schneider (Dukes of Hazzard) in A Gift Of The Heart. A Taekwondo and Judo expert, Austin also aided the U.S. armed forces overseas as a medic. Today the Roswell, New Mexico native keeps busy acting and connecting with fans on the convention circuit. Austin currently resides in McKinney, Texas. While exploring America like never before, each team is provided 1,000 posters featuring a particular missing child to distribute along the 1,200-mile journey. Austin has been assigned 6-year-old Alan Rodriguez, who was last seen in Cedar Park, Texas on Sep 2, 2016. Fireball Run’s Race to Recover America’s Missing Children awareness campaign for The Child Rescue Network, a Florida based 501c3 charity, has aided in 49 recoveries since 2007. The nine-day, forty-team, point-based competition is filmed live in different cities. Using just clues, contestants find locations where they are to take part in a rare experience or unique challenge. Daily competition ends to a live event attended by spectators and media. Although the trophy is a plastic road sign, the real prize is the journey. Fireball Run: Big Country films September 23-30, 2017 in the destinations noted below. Eau Claire, WI (Green Flag City) Sep 23 – 24; Rochester, MN Sep 24 – 25; Dubuque, IA Sep 25-26; Burlington, IA Sep Sep 26/27; Fort Dodge, IA Sep 27/28; Vermillion, SD Sep 28; Yankton, SD Sep 29; Pierre, SD Sep 29/30; Rapid City, SD (Checkered Flag City) Sep 30.